Perfect Pitch vs. Relative Pitch: How Do They Compare? How they work together to give you the complete musical picture . . .
and Relative Pitch, compared to either skill separately. Q. Why do I need Relative Pitch when I can have Perfect Pitch? Musicians often think that Perfect Pitch is supremely superior to Relative Pitch. It's true in some ways, but it's like comparing apples with oranges. The truth is, Perfect Pitch and Relative Pitch are completely separate hearing skills, each with its own unique powers and abilities. Perfect Pitch and Relative Pitch are complementary. They do their jobs best when they work TOGETHER like the two hemispheres of your brain. Relative Pitch gives you an intellectual (left brain) UNDERSTANDING of what you hear, whereas Perfect Pitch gives you the artistic (right brain) PERCEPTION of what David Lucas Burge calls "pitch color." 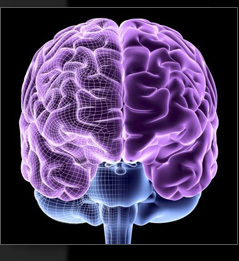 Perfect Pitch and Relative Pitch work together like the artistic (right) and logical (left) hemispheres of your brain to give you the complete musical picture. With a completely untrained ear, there is little or no insight into what you hear. Of course, everyone can ENJOY music without any training whatsoever. But an untrained ear doesn't give you any UNDERSTANDING of the music. Simply put, without Perfect Pitch or Relative Pitch, you literally have no pitch recognition. Since music is a HEARING ART, a great ear gives you a natural command of the musical language. A "great ear" means: an ear that understands PITCH. Bottom line: An untrained ear leaves you with unanswered questions about everything you hear. All details of the music are lost. 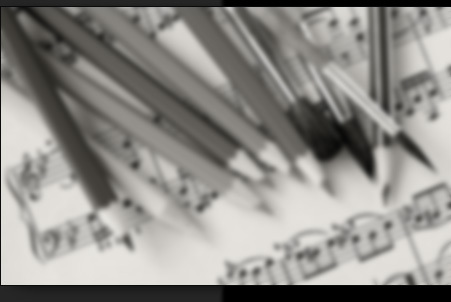 Without Perfect Pitch or Relative Pitch, your understanding of music is bleak and blurred. You now hear the music with a clear, sharp focus. Your sense of Relative Pitch tells you how pitches RELATE to one another to create the language of music. Now you truly hear what is going on in the music. In fact, Relative Pitch gives you the complete language of intervals and chords, all at your fingertips  essential when you compose or play by ear. When you understand the language of music fluently, you can creatively choose how to harmonize a melody and how you want your harmonies to progress to create a musical flow. And when you can FOLLOW THE FLOW OF MUSIC by ear, you can naturally improvise and play by ear to an impressive degree. Relative Pitch gives you mastery of the musical language  all BY EAR. With Relative Pitch, you hear music with a fully clear and sharp focus. Does it give you the complete musical picture? Relative Pitch confers countless talents and skills on you because you can hear with crystal clarity and focus. In fact, many musicians believe that Relative Pitch is all they need in order to be a great musician. And for many people, this is probably true. But Relative Pitch lacks a certain aesthetic experience. It lacks the artistic experience of pitch COLOR . . .
Do you hear in color, or "black and white"? What do we mean by "pitch color"? Well, even with the full clarity of Relative Pitch, you are still hearing all the tones as "black and white." In other words, they all sound basically the same. The only real difference is that some tones sound "higher" and some sound "lower." Relative Pitch cannot tell you when you hear a C#. 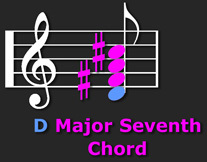 Nor can Relative Pitch tell the difference between a D Major 7 chord and an F Major 7 chord. 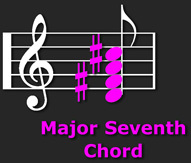 What Relative Pitch DOES tell you is that the chord (as in above example) is a Major 7 chord. Something more is needed in your experience to know the EXACT tones you are hearing. Perfect Pitch give you the perception of an ARTIST. It endows you with the rich COLOR of every pitch you hear. When you hear a C#, you know it's a C#, and not a Bb  similar to the way you can tell red from blue. This experience revolutionizes your abilities in music, because now you know the EXACT TONES you are hearing. This opens up countless talents and possibilities to any musician. However, contrary to popular ideas about Perfect Pitch, Perfect Pitch ALONE does not give you the full details of the music. Without the clarity of Relative Pitch, your experience of music may not be fully focused. To gain the full details of what is going on in the music, another dimension of hearing is needed. This is the dimension of Relative Pitch . 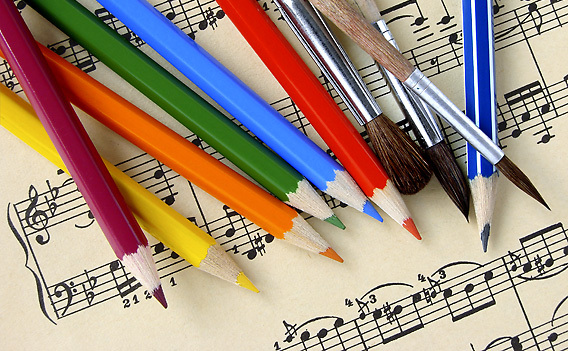 . .
Music gains a colorful artistry that lets you distinguish EXACT PITCHES  by ear  similar to how you can name colors by eye. This finer perception revolutionizes your hearing skills and opens up a whole new range of artistic musical possibilities for you. Relative Pitch tells you, for example, that you hear a Major Seventh chord. But now the question is: WHICH Major Seventh is it? Are you hearing E Major Seventh? G Major Seventh? Or maybe . . . F# Major Seventh? This is where your Perfect Pitch comes into play. Perfect Pitch tells you the EXACT TONES, so you can pinpoint the ROOT of the chord you are hearing. Now you hear the COMPLETE musical picture  in color and sharply focused. You gain 4X the power and abilities of either skill when compared separately. Working together in many ways, Perfect Pitch and Relative Pitch give you complete knowledge of the notes, chords, melodies, harmonies, and progressions that create all music. And you get this all BY EAR. Q. Yes, but doesn't Perfect Pitch also tell me the KIND of chord I'm hearing? No. Perfect Pitch tells you the EXACT TONES. It is your sense of Relative Pitch that lets you understand how tones RELATE to each other to form chords. In English, LETTERS of the alphabet are used to make WORDS. Each word has its own meaning. These words are then strung into SENTENCES that give you a further meaning. It's similar in music . . . Individual PITCHES of the chromatic (colored) scale are used to make CHORDS. Each chord has its own particular sound. Chords are then strung into musical PROGRESSIONS that create a musical statement. Perfect Pitch tells you the EXACT PITCHES you hear (like knowing the "letters" of the musical alphabet). But individual letters do not make a language. And individual pitches by themselves do not create music. Only Relative Pitch lets you understand how all the tones are arranged to create the actual LANGUAGE of music. Q. My friend has Perfect Pitch and can name any kind of chord (like a "half diminished seventh"). If someone tells you that he hears (for example) a Half Diminished Seventh chord using his "Perfect Pitch," just smile at him. He's not really using Perfect Pitch for this. Instead, this is his Relative Pitch speaking. Why? Because he is describing how the tones RELATE to each other  part of his sense of RELATIVE Pitch. This is where Relative Pitch gets its name: "Relative" refers to how the tones relate to each other. Q. OK, but in general, isn't Perfect Pitch better to have than Relative Pitch? Perfect Pitch cannot replace Relative Pitch. Only Relative Pitch gives you the clear picture of MUSIC IN MOTION. Q. Why do I need Relative Pitch to understand music in motion? L - i - k - e - T - h - i - s? Probably not. Instead, your ear groups these letters into WORDS and PHRASES that you can understand. Music is a quickly flowing stream of tones: D, G, A, F#, G, E, F#, D, etc. Even when you can know each pitch perfectly, music is much more than these individual tones. If you want to understand the LANGUAGE of MUSIC, Perfect Pitch is not enough. Another dimension of hearing is required. This is the dimension of Relative Pitch. Relative Pitch groups the "LETTERS" of the musical alphabet into "words" and "phrases" that you can quickly understand. In other words, Relative Pitch groups NOTES into intervals, chords, and progressions that you can easily understand and follow. This is why only Relative Pitch gives you SPEED RECOGNITION of music in motion. ONLY Perfect Pitch gives you the rich COLOR experience of music  so that you can name and sing EXACT tones  all BY EAR. ONLY Relative Pitch gives you mastery of the varieties of chords, intervals, and harmonies that create the LANGUAGE of MUSIC, along with SPEED RECOGNITION of music IN MOTION. Perfect Pitch and Relative Pitch TOGETHER complete your musical experience and give you a totally professional ear for music. Q. Which course should I start with: Perfect Pitch or Relative Pitch? Most people start with the Perfect Pitch Ear Training SuperCourse. Others want to first master all their music language skills  they begin with the Relative Pitch Ear Training SuperCourse. You'll make your fastest progress when you study both courses at the same time. A simple Relative Pitch tune-up unclogs and opens even the most closed, stubborn ear  which also greatly SPEEDS UP your Perfect Pitch progress. Your ear becomes more naturally open and free. Pro Tip: Musicians around the world agree: you get fastest results if you do your Perfect Pitch ear training, say, for a few minutes each MORNING, followed by your Relative Pitch training for a few minutes each EVENING. Listen daily from both angles, and you will soon own the prized possession: a virtuoso TOTAL EAR for music . . .
Order both SuperCourses NOW (see below) and save an extra $70. Learn to understand and speak the language of music with both Perfect Pitch and Relative Pitch (see details below).